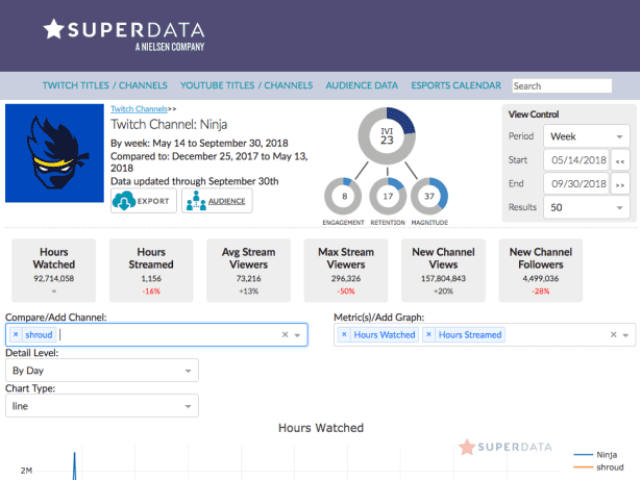 Recent Nielsen acquisition SuperData is launching the SuperData Arena dashboard, described as a breakthrough new media measurement tool developed to provide games publishers, brands and sponsors with in-depth audience metrics and insights across gaming video content (GVC) and esports platforms and services. This tool will look to determine the value of top games, industry influencers, popular streaming content, game channels and audiences by tracking a wide range of metrics, such as the number of hours streamed and watched, average concurrent viewers and channel followers across Twitch, YouTube and other top streaming games sources. The company states that leading brands and publishers will be able to use Arena to better inform their sponsorship decisions with SuperData’s proprietary Influencer Value Index. This allows clients to track video games content retention, engagement, magnitude and overall value to determine the best sponsorship ROI. Brands will also be able to use Arena’s interactive dashboard and reports to gauge the value of the top game streamer’s audiences with easy-to-visualize data that features demographic information and purchase intent.